“The Play That Goes Wrong” centers on a troupe of hapless amateur actors. From pratfalls, missed entrances, and flubbed lines to misplaced props and broken set pieces, there’s nothing that Jonathan Sayer loves more than when a theatrical enterprise devolves into a moment of seeming disaster. Sayer, who co-created the hit Broadway comedy “The Play That Goes Wrong,” remembers seeing Sean O’Casey’s “Juno and the Paycock” at Britain’s National Theatre in which a bereaved mother was getting ready to make her entrance into a Dublin tenement flat and deliver a crucial monologue mourning the loss of her son. But the set door got jammed and wouldn’t budge. 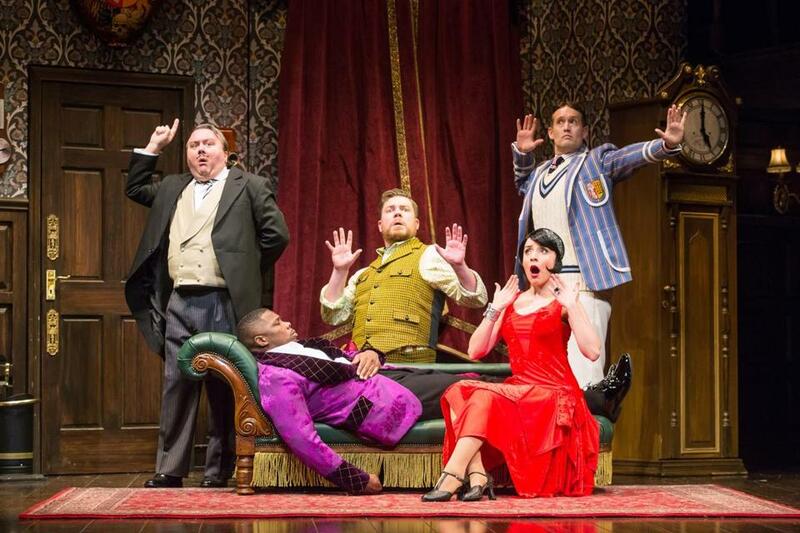 Indeed, pratfall- and pandemonium-filled moments, seemingly impromptu but plotted out like a precisely choreographed ballet, suffuse the madcap farce “The Play That Goes Wrong,” co-created by Sayer and two of his cohorts from the Mischief Theatre company, Henry Lewis and Henry Shields. The tour of that show, which won the Olivier Award for best new comedy and is scheduled to wrap up a nearly two-year Broadway stint in January, comes to the Emerson Colonial Theatre Nov. 7-18 in a presentation by Broadway in Boston. A punch-drunk melding of “Monty Python,” “Sherlock Holmes,” and Michael Frayn’s classic backstage farce “Noises Off,” the show features a play-within-a-play setup centering on a troupe of hapless amateur actors from the Cornley University Drama Society attempting to perform a hoary whodunit, “The Murder at Haversham Manor.” As one thing after another goes haywire, the whole cracked enterprise, including the ramshackle set itself, begins to come apart at the seams. The antics include tone-deaf acting, malfunctioning set pieces, misplaced props, forgotten lines, slamming doors, indisposed actors, missed entrances, crashing scenery, and corpses that won’t stay dead. The key to the whole comedic endeavor lies in the show’s bumbling actors and clueless stagehands desperately trying to maintain the theatrical illusion that they’re holding it all together despite the demolition derby of destruction unfolding around them. “[Our characters] are convinced that when something goes wrong, that will be the last thing that goes wrong all night,” says Ned Noyes, who portrays Max, an actor who discovers his own powers of audience ingratiation. After several years of developing long-form improv shows, the three friends decided to attempt a traditional, scripted slamming-door farce. They were inspired by a humor book about amateur theater in Britain called “The Art of Coarse Acting” by Michael Green, which skewers acting incompetence and the pretentiousness of theater while celebrating its hilarious and hapless disasters. At the time, the trio were slogging through uninspiring day jobs to pay the rent — Shields in a pub, Lewis at a burger joint, and Sayer at a call center. They chose the murder-mystery genre because of its familiar, formulaic quality. “We wanted something that was very serious that we could undercut, and we thought there isn’t anything more serious than a very staid, British murder-mystery,” Sayer says. After two runs at the Old Red Lion, the show transferred to a larger space, Trafalgar Studios, and began generating “a cool underground buzz,” Sayer says. The production eventually ended up in London’s West End, where it’s still playing, and has toured internationally. It also spawned a sequel, “Peter Pan That Goes Wrong,” and a Mischief screwball caper about a priceless diamond, “The Comedy About a Bank Robbery,” that’s still playing in the West End. “It’s been a totally surreal six years,” Sayer says.